NEW FELINE MUTATIONS - WHAT HAPPENS NEXT? Currently cat breeders have a variety of shapes, forms and colours/patterns they can work with, allowing them to mix and match traits to create new cat varieties. Selective breeding and chance mutation has given breeders access to a wide variety of traits in cats. Some breeders are now - for better or worse - operating mix and match breeding schemes e.g. to produce a bobtailed, folded-ear, curly-coated, polydactyl Munchkin. Working with a single structural mutation is hard enough e.g. preventing skeletal deformities in Scottish Folds or pelvic deformities in Manx. Mixing together multiple genes, some of which are associated with problematical side-effects, is a minefield. Some combinations have not yet been explored e.g. agouti (abyssinian) pattern Persians and the current trend seems to be towards modified size, shape and conformation rather than creating new combinations of existing conformation and colour. Some of this is due to breed societies restricting what colours are acceptable within breeds and making it difficult (or, as in the UK, impossible) to register variants under new breed names. However, all of this is simply playing with existing traits. Nature knows no such boundaries and not only mixes and matches traits without any regard to breed society rules, but also creates entirely new traits through random mutation. In the feline genome, some areas are known to be mutational "hotspots" e.g. the short-legged, bobtail and rex fur mutations have all occurred independently in various unrelated geographical locations over the centuries. But compared to mankind's other long-term companion animal, the dog, what happens next? This article looks at some of the mutations which are found in dogs (which have been selectively bred for centuries) with those found - or not found - in cats (which have been selectively bred over decades). Cat and Ultra-Cat - A Breed Too Far? 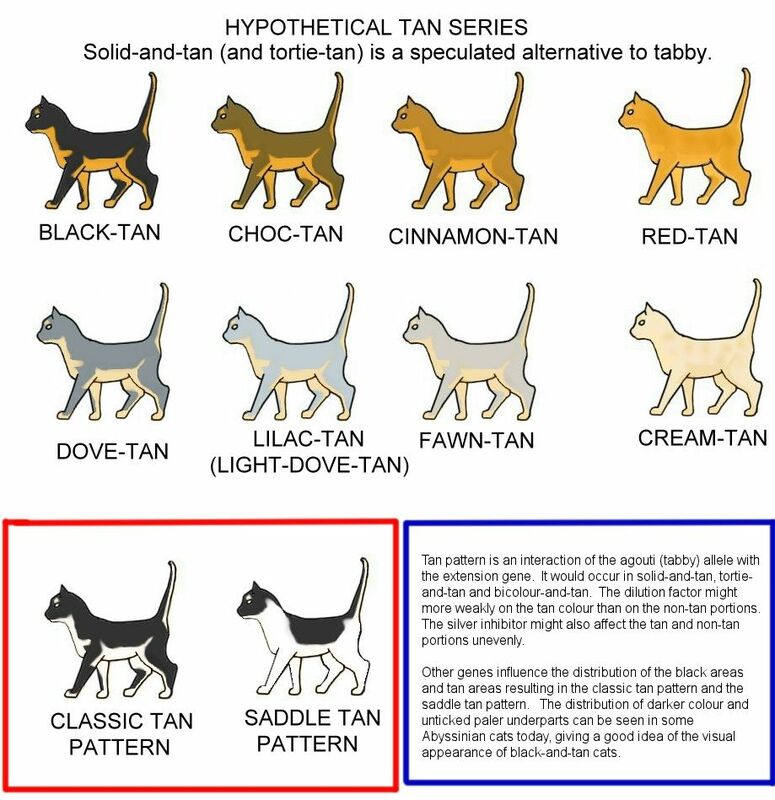 The basic cat colours are: solid/self (the body is all one colour), bicolour (white and coloured patches), tri-colour (calico), tortoiseshell, colourpoint (the "Siamese" pattern), tabby (stripes and swirls), spotted and rosetted. The wide range of colours seen at shelters and shows are variations on these themes. 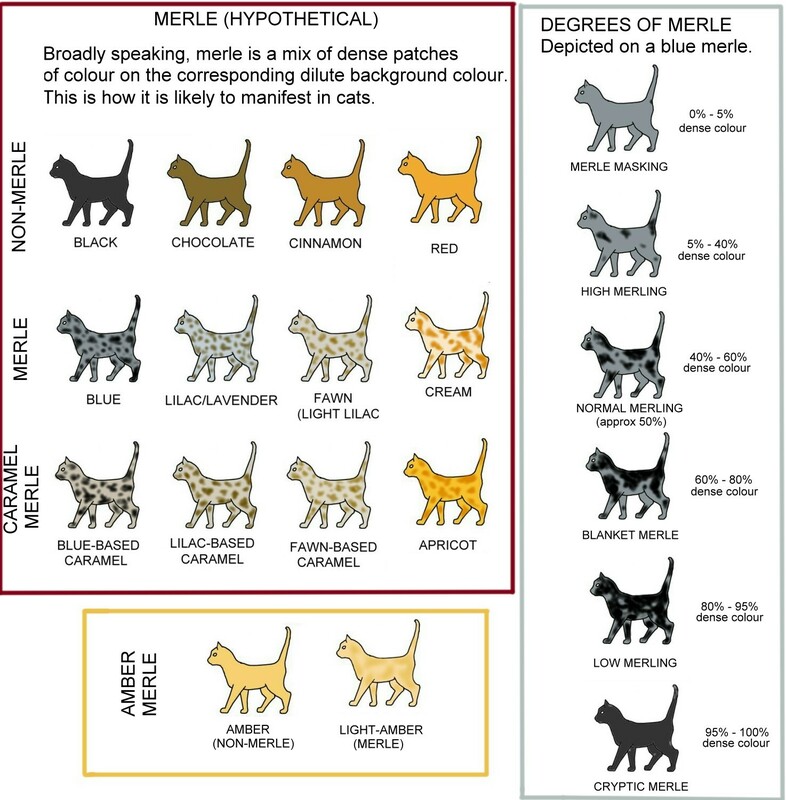 There are several colours and patterns which are commonly seen in dogs which some breeders would be interested to see in cats although the management of new colour mutations could also be a genetics nightmare. The first is known as "tan" (or black-and-tan) and is found in dogs, rabbits and some fancy rodents. In rabbits and rodents, black-and-tan appears to be a genetic alternative to agouti/non-agouti (i.e. ticked/non-ticked fur). In the black-and-tan animal, the upper parts are a rich glossy black and the belly, underside of the tail, inside legs, chest, chin and lower legs are a rich reddish tan colour. The action of dilution genes could change this to blue-and-fawn or modify it to chestnut-and-fawn (these variations are found in some black-and-tan dogs but are rarely exhibited at shows). In some dogs, the black-and-tan colour is restricted so that the body is tan with a black saddle and black markings on the head. 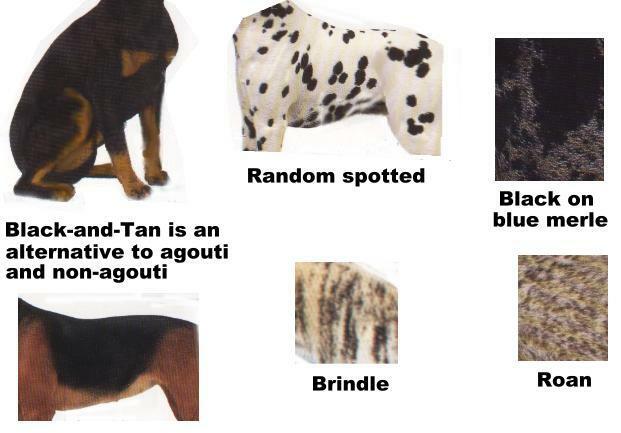 Another pattern not found in cats at present is the random spotting of black-on-white or liver-on-white found in Dalmation dogs. Again, dilution genes could transform this to blue-on-white and the red gene (which produces tortoiseshell cats) might interact to produce a mixture of blue spots and orange spots on a white background. Roan colours are also not found in cats. Blue merle is a mixture of black (or grey) and white hairs to produce a blue effect, often with black dots. Roan is a mixture of brown (or liver) and white to produce a speckled pinkish coat. In theory, roan can be a mix of any colour and white. Although some tortoiseshell cats show brindling, the effect is not the same as the canine brindle pattern (seen in Greyhounds and related breeds) where there are distinct, but randomly placed, vertical streaks of slate on a fawn background. Many centuries of selective breeding mean that dogs have been developed into a wide range of sizes far removed from the basic size of the wolf ancestor. They range from the extreme small size of the Mexican Chihuahua to the extreme large size of the Japanese Tosa. In addition their bulk varies from the extreme gracile build of the greyhound family to the massive build of the mastiff family. Because dogs have lived in close association with man for so long, any mutation causing a change in size would be noticed and capitalised on - larger dogs for guarding duties and hunting large prey, smaller dogs for companions and for pursuing prey into a burrow, thin dogs for hunting at high speed, massive dogs for fighting and baiting. Humans had the opportunity to notice changes in body type and the incentive to develop any mutant individuals into new or improved breeds. With one or two possible exceptions (e.g. the extinct Mexican Hairless), cats have been selectively bred for less than two centuries. Unlike dogs, they have not lived in such close proximity to humans and they have not been employed in as many diverse roles as have dogs. This means that humans have been less likely to notice mutant individuals and, where mutations have occurred, humans have lacked the incentive to selective breed those mutations. In fact, until the late 19th Century, in Europe at least, the very idea of selective breeding cats (described as faithless companions and fickle friends) was considered laughable. As a result, cats have stayed very much the size nature made them, ranging from the small and lightweight breeds found in hotter areas, through to larger, cobbier builds found in colder climes and various intermediate forms. Only very recently have mutations been discovered which allow dwarf or near-dwarf breeds to be developed. Dwarf and midget cats have occurred in the past, but the interest and expertise to breed them was not present. At present the genes allowing the development of giant breeds have either not occurred or have not occurred in a place where humans have been interested in perpetuating the trait. At present, there are only minor variations on the feline shape - curled back-swept ears, cap-like folded ears, pom-pom tails, short legs and the range of builds from cobby (Persian) through to svelte (Oriental). Although all dogs came from basic prick-eared, wolf ancestors, millenia of selective breeding have given risen to numerous body shapes. Some breeders have attempted to emulate dog breeders in producing new shapes. The modern Siamese is extremely thin (some would say too fragile-looking) with a long thin muzzle and almost bat-like ears. Its build can be compared to that of the Greyhound. The brachycephalic Pekingese has a muzzle so flat that the dog is essentially flat-faced. The ultra-type Persians are heading unhealthily in the direction and for a while there was actually a Peke-faced Persian variety due to a mutation which affected the skull. There is therefore potential for Pug-faced cats. Chihuahuas have "apple skulls" with small sharp muzzles and domed foreheads and the contemporary Burmese in the USA aimed for a domed head, but this produced a variety of skull defects and eye problems. Mutations and changes which have relatively little detrimental effect on dogs could have major health concerns for cats. There is also the danger of introducing the same health problems into cats as are seen in dogs such as the breathing problems of the massive-jawed English Bulldog. Although the wolf has a sharp muzzle, there are many dog breeds whose muzzles are broad, often with a protruding lower jaw as in the Bulldog. This was to enhance their bull-baiting abilities, but in modern times the trait is perpetuated for aesthetic reasons, having long since outlived its original function. New chance mutations might have breed potential, but breeders must also look to the problems found in certain dog breeds before deciding whether to perpetuate an equivalent mutation in cats. Perhaps the most obvious attempt to date to create a dog-like cat is the Poodle Cat which combines the Scottish Fold and Devon Rex. It would be possible to enhance the Poodle-like look further by crossing it to Manx to create tailless or short-tailed cats. Unfortunately both the Scottish Fold and the Manx traits are associated with crippling or lethal skeletal deformities and combining both genes in a single breed is a sure recipe for disaster. 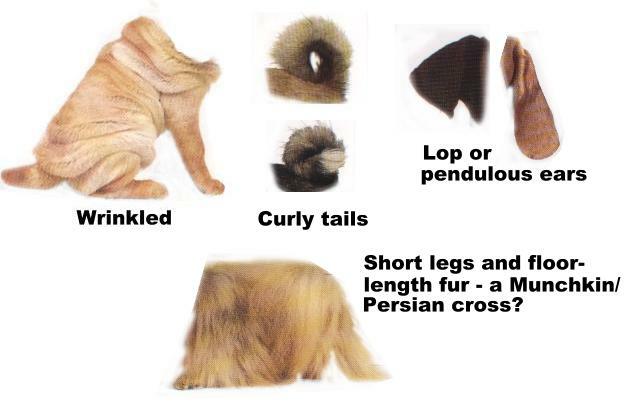 By combining the longest-haired Persians with the short-legged Munchkin, a cat similar to the Maltese Terrier or Lhasa Apso could be obtained - add folded ears and either taillessness, a bobtail or the curly-tailed trait and the dog-like effect would be complete. Curled and folded ears occur in cats, but in dogs this has been taken a step further with the ear flaps become greatly elongated and pendulous. Instead of being cap-like, the ears flop loosely by the side of the head, some being so long that the reach the shoulders. In the canine world, the prick-eared/lop-eared trait has gone full circle with some breeds of lop-eared dogs having their ears cropped, a wholly unnecessary operation performed to make a dog look more alert or vicious (or just to conform to an arbitrary breed standard). There are already several varieties of hairless cat, but what about combining this with a different body type? Instead of svelte Sphynxes, how about hairless Persians? Hairlessness would help display the extremely short muzzle and large forehead of this conformation. In dogs, there are powder-puff versions of some hairless breeds where there are pom-poms of silky fur e.g. on top of the head. A Powder-Puff Sphynx would certainly be a stunning creature. Some fighting dogs have been bred to be excessively wrinkled, either around the face only or, as in the Shar-Pei, over the whole body (this being most apparent in puppyhood). The wrinkles present a problem in that they present an ideal site for certain bacterial and fungal infections. The Sphynx looks slightly wrinkled though this is because the natural wrinkling of the cat's skin is visible instead of being hidden under the fur. Exaggerate the wrinkling and a feline equivalent of the Shar-Pei could be created. As well as the tailless Manx, there are a variety of bobtailed cat breeds. Taillessness is found naturally in dogs, but most apparently tailless/bob-tailed dogs are victims of surgical mutilation. The practice of tail-docking is common in the canine world for purely aesthetic reasons and is an unnecessary hangover from the days when a working/fighting dog's tail was docked to reduce the risk of injury. Many dogs have tails which curve up over their backs or are held close to their flanks in a tight curl like the tail of a pig (Akitas, Chows). This trait has been seen in cats throughout the world but, until now, has not been bred.